A native of Georgia, award winning singer songwriter CJ Smyth writes with a signature poetic lyrical style. She learned to walk to the Beatles and was saturated with the country sounds of rural radio. Later she found inspiration in the songs of Dan Fogelberg, the Eagles, the Indigo Girls, Melissa Etheridge, and Catie Curtis. Like a hint of vanilla in your latte, these influences provide a sweet background to her original work. Her debut release “Miracle Alley” with duo CYNOVA was ranked #4 on the Outvoice Top 40 CDs of 2007 and nominated by Pride in the Arts for “Favorite Album of the Year” that same year. After the early death of a close friend CJ began an internal journey of emotional housecleaning. Her debut solo effort “Common Shaman” is the result of that journey and takes a hard look at the human condition with songs about relationships, our place in the global community and the universe. A solid folk endeavor ranging from the whimsical rocking “Cyber Tech Chick v. 5.03A” and “That’s What I Get”, heart opening ballads “Open Hand” and ”Hold Me Close” and Enyaesque tone poem “Falling Into Grace”. A veteran of Pride festivals and coffee houses, CJ currently plays small shows in and around her home in Louisville, Colorado. I love finding new artists that remind me of other artists, but have their own distinct sound which sets them apart. Georgia native C.J. Smyth’s voice reminds me of the laidback caress of Aimee Mann, her tone takes me to the dark approaches of Mazzy Starr’s Hope Sandoval, and her songwriting echoes the honesty of Joni Mitchell. Not quite Folk, Country or Rock, Smyth falls into the category of Homespun Rock Angels like Sheryl Crow or Alana Davis. The twelve tracks on C.J. Smyth’s Common Shaman cover a lot of emotion and many points of sadness, however it’s not grim. The relationship songs are complicated as most relationships are and the songs of inspiration are within realistic expectations. Well rounding out the experience are a few upbeat numbers that add richness to the project. Of these, “Sweet Mercy” stands out for me and is geared at being the most commercial. Miranda Lambert would be smart to cover this seductive number with it’s religious undercurrent. C.J. is a noteworthy up and comer. I’d like our readers to be able to get some insight into someone whom in my opinion knows how to “do it right” when it comes to putting your dreams on the map and letting the cosmos take over from there. Gaysonama: C.J., I wanted to tell you that I really enjoyed your Common Shaman project. I can tell a lot of time, love and emotion went into it. I’d like our readers to get to know you better, so tell me a little about yourself. How did you start out to be a singer-songwiter, what made you select such a sometimes non-rewarding profession, and what were some of the hurdles along the way to this point, your first solo effort? To answer your questions, I came to professional songwriting a bit later in life. I played guitar and wrote prose from a young age, and in college decided to try combining the two and loved it. I wrote mostly for my own enjoyment or for friends and family celebrations until I was about 30. At that time I developed Rheumatoid Arthritis and my hands were really being affected, I decided that if I was going to give myself a shot with my music I needed to do it or I might not get the chance. Luckily some new treatments came along a few years later and my hands are still doing well. My first professional venture was a trio, Cynova, and I wrote all of our original music. We were just starting to talk about cutting a record when one of our group, Valerie Van Zyl, was diagnosed with Ovarian cancer. She died 15 months later just a few weeks before we were to go into the studio. We did go ahead and cut that record “Miracle Alley” with the remaining member Nora-Ellen Long and my partner Kit Thompson filling in for Valerie’s part. We were excited to have it nominated for Pride in the Arts (PITA) Favorite album of 2007. Afterwards, I wanted to be more intentional about what I created with my life and put out in the world. I worked to get clear on what was important to me and how my music was an expression of that. The songs on “Common Shaman” are a result of that reflection. I also knew from my previous experience that I wanted to have more creative input on the production of this album and it soon became clear it would be a solo project. Gaysonoma: Starting out later in life reminds me of one of my favorite Country Singers, K.T. Oslin from the later 80s, do you remember her? Seasoned performers even “new to the game” have that built in confidence which is very apparent. You surely have that in common. I noticed your partner Kit is not a performer on Common Shaman. Is Cynova on hiatus for now? C.J. Smyth: I do remember her, I especially like the tune “Hold Me” such richness and texture in her vocal! Cynova decided to disband in 2013, after a wonderful 12 year run we all were interested in other directions creatively, luckily it was on good terms, and we support each other 100%. Kit was just helping out with the third harmony part as the songs had been arranged (for which I am grateful!). She did the photography on both albums. I really wanted “Common Shaman” to develop more organically in terms of supporting vocals and instrumentation and found the perfect producer in John McVey. Rather than take a set arrangement into the studio, John and I worked hard to find the right backing musicians and vocals lines for each tune. Gaysonoma: Your planning C.J. paid off well. I have listened to thousands of debuts over the years. Many seem to have something a bit off about them. The vocal drowns in parts or some backing tracks seem off. “Common Shaman” was put together very well, so hats off to you and your team! My favorite track is “Open Hand.” Now that I’m speaking to you directly you can uncover the mystery for me. I took it as a tale related to domestic abuse. I am I right? What is the actual meaning behind that song? C.J. Smyth: Thank you so much, I really appreciate hearing that from you. I could not have been happier with how “Open Hand” came out! The arrangement we came up with really serves the song well. I love hearing about how people relate to lyrics, I hear many different things that get touched in people, it’s like all the facets of our humanity comes out. My usual answer is, if that is what you are hearing then yes, that is what the song is about! But I will answer you more directly, the song is an explanation from one partner who needs more independence and space in relationship to the other who worries this means they are not committed and maybe a little self destructive at times. It is a way of saying, I am here and when I go away it’s to gather myself in order to come back more fully present. My partner Kit calls it one of her instruction songs. GAYSONOMA: When there are many interpretations, that is the sign of a really good song. The title track and title of your CD “Common Shaman” seemed to have a mystical connection. What was the inspiration behind that and why did you select it as the CD’s title? C.J. Smyth: I was studying Peruvian shamanism at the time. The philosophy is with the right tools the gifts of the shaman are available to everyone. I just hit on the “Common Shaman” as word play one day and really liked it. I planned to title the CD that before the song ever came into being. It circles back to what I was saying earlier about wanting to be more intentional with what I was putting out in the world, focusing more on positivity. The song posed a challenge musically as it one of several that I alter the tuning on by adding multiple capos to the fret board, so it’s not as straight forward for the musicians to play. John had to do a big of arranging to accommodate that. Gaysonoma: C.J., if I was to pull a single from the album, my choice would be “Sweet Mercy.” It has playful and lightly seductive lyrics, and a slight blues feel while bordering on country-soft rock. I could see Linda Ronstadt, Bonnie Raitt or Miranda Lambert scoring well with that track. What was your direction with that number? C.J. Smyth: That one is super fun to perform live too! You are right on with that one. I had been out with some friends the night before I wrote this and we were watching these two women do this kind of fun, flirty dance back and forth all night, taking bets on whether they would hook up or not. I sat down to write the next day. It had been a while since I had written anything and I was having a little writer’s block. I sometimes try to write something like someone else might to get things flowing when I feel a little stuck, so i asked myself, “What would Melissa Etheridge say about last night” and this was the result. Sometimes I get keepers out of that and sometimes not, but it’s fun. Gaysonoma: Well that makes me really happy C.J.. I can tell you really enjoyed creating it as much I enjoyed discovering it. On the subject of inspiration, in closing, what single artist has influenced you and your creativity the most throughout your career and how? Also, what one song do you wish you had written and why? C.J. Smyth: Wow, that is such a difficult question, there are so many inspirations out there Melissa E, Aimee Mann, the Indigo Girls all come to mind. I had to really think about this for a bit as you said “the most” over my career. I think I would have to say it’s a toss up between Ferron and Dan Fogelberg for many of the same reasons. They both cut across the folk, rock and country genres adeptly, they both write stellar lyrics, though I might give that one to Ferron. The prosody they both utilize in their music can create some exceptional emotional moments. I’d have to give Dan the upper hand in musical composition though. He used so many different chords to create a song. If I need some restoration these are the two I come back to over and over after many years. Okay that was a really long answer! I’ll give you a favorite from each of them that I wish I had written “Ain’t Life a Brook.” by Ferron because the lyrics paint such a great picture of what it’s like healing from a break up over time and the vocal delivery is awesome. Then Fogelberg’s “Dancing Shoes” because the musical arrangement is so sparse and delicate and supports the feeling of the lyric perfectly, wonderfully crafted. Thank you so much for this opportunity I have really enjoyed it! Our thanks to C.J. for her time and personal exposure into the realm of media. You can find C.J. 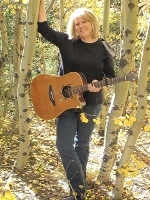 Smyth’s music at several venues including Amazon, CD Baby, CD Universe, and at www.cjsmyth.com.